Professor Narendra Nayak, President of the Federation of Indian Rationalist Associations, published the following noteworthy essay on Sathya Sai Baba on May 18 2011 (See Nirmukta, a forum promoting science, freethought and secular humanism in India). 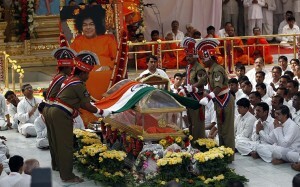 Sai Baba had at that time just passed away, to the utter astonishment and disbelief of his followers. In this down-to-earth epitaph, Professor Nayak takes stock and calls for an unorthodox step pertaining all donated funds held by the Sathya Sai Baba Central Trust. Now that the dust has settled down around all the hullabaloo created by the demise of an 85-year-old man kept on life support systems for nearly three weeks, provided with the best of medical treatment etc, it is time to take a hard look at the facts. Our movement has been at the forefront of questioning, investigating and exposing so-called paranormal phenomena. Our organisation, the Federation of Indian Rationalist Associations, was founded by B. Premanand who had taken the lead in exposing the paranormal claims of this individual Ratnakaram Satya Narayana Raju, more popularly known by his alias Sathya Sai Baba. Magicians claiming to be rationalists have rushed to the press, some self-proclaimed leaders of the movement have made statements, and now it is time for the President of the FIRA to review and present the views of the movement before the public. It has been claimed that the so-called miracles of Sai Baba, like materialisation of ash, small objects etc, were not important. This is far from the truth. It is because of these that he became popular. It is also claimed that he had stopped performing them after a meeting with one famous magician! But, this is not so. The meeting with this magician is supposed to have taken place more than two decades ago and it is on record that in Chennai rings were ‘materialised’ for ministers of the so-called ‘rationalistic’ party the Dravida Munnetra Kazhagam’s top brass! Sai Baba also claimed that these miracles were his calling cards! We fail to understand how such bogus calling cards impressed people, including the past president of India, Dr. A.P.J. Abdul Kalam, who is supposed to be the very epitome of scientific temper! He who always encourages children to ask questions could have asked this man how he was able to produce matter from thin air! But, obviously advise is always for others! No one has asked why the man who has supposedly healed thousands by the mere application of his holy ash was unable to heal himself. As he has claimed in his own publication, Sanathana Sarathi, he never suffers from any illness because he has no trace of greed! He had also said in the same that purity, patience and perseverance “are three responsible for my health (arogya) and bliss (ananda)!” One wonders as to how he fell ill then? Is it because he developed greed? Or did his patience, purity and perseverance run out? One of them or all of them? Those who call him Bhagwan would be well advised to refer to him by some other name more befitting his status of mortality! How did this man with a smattering of English, without any formal education manage to build up such an empire? It is because of his native shrewdness. After attracting the locals with his prestidigitisation, he stepped to the other states and then managed to attract some frustrated people from the West. His name and fame grew. He also acted as a conduit for the ill-gotten gains of the politicians and he mediated in their disputes. This explains his popularity amongst politicians of all shades and ideologies, with the possible exception of some on the left. His trust had been exempted from all the laws pertaining to import of foreign funds, and what better way can there be to get money stashed away in banks abroad? It is funny that those going on fasts to oppose corruption do not see this nexus between religious institutions and corruption. On the other hand, those who were paupers a couple of decades back and possess empires worth thousands of crores today have jumped on to this anti-corruption band wagon. It is also said that Sathya Narayana Raju went abroad only once, and that too to Uganda. It was to bring the illegally begotten wealth from a shady deal involving sale of tanks of the Indian army as scrap to Idi Amin, one of the most infamous despotic dictators in recent history. He has been also known for his donations to an infamous lady – ‘Mother’ Teresa! It was not that the laws of the land were not applicable to him in collection of funds. Numerous allegations of pedophilia have been glossed over. There have been many mysterious deaths which have always been written off as if they were minor traffic violations. More importantly, the six murders in his bedroom with the bodies bearing marks of torture and shooting at point-blank range were written off as an internal matter, as if the laws of the land were not applicable to Puttaparthi. The past Prime Minister of India, Atal Bihari Vajpayee, went on record to state that he was innocent! Though the murders took place in his bedroom Sai Baba was never questioned. So much for the law being the supreme! Laws of the land were never a problem for him. Having an airport in Puttaparthi meant that things could be brought directly in. The tonnes of gold around the place in various forms bear witness to that. When late B. Premanand took him to court under the Gold Control Act, the law came to his rescue by stating that he was ‘creating’ gold which was not covered by that act! Anyway, on one occasion when he was ‘materialising’ a gold chain in the presence of the then Prime minister of India, Mr. P.V. Narasimha Rao, the Doordarshan cameras caught the trick he was using – removing a necklace concealed under the memento which he was to presenting. Sai Baba was also a creation of the media. One weekly called Blitz was initially critical of him, and then in a volte-face started singing praises of him. It was not a surprise, as the integrity of the editor was well-known to many! The TV channels of the South have not shown much courage in exposing him. But many popular ones of the North have had no such qualms. In fact, two years ago when I had handed over some very old footage of the exposure of his so-called miracles to some TV channels in Kathmandu, they went to town as though the expose was theirs and the latest news! It was only the courage of some of the TV channels of Europe which exposed him. Channel IV ran a series called the Guru Busters in which he was totally exposed. In 2004 the BBC aired a documentary called The Secret Swami which exposed his miracles, pedophilia and also the murders in his bedroom. In that documentary, the minister for HRD, Dr. Murali Monohar Joshi, was shown defending Sai Baba very, very vocally – in fact threatening the reporter! There was another one by a Danish TV station called Seduced by Sai Baba (2002), by one of his victims who preferred to be anonymous. One of the reasons why the boys from economically backward sections were kept in his schools with all free amenities was they could be easily exploited sexually and their parents being poor could do nothing about it even if it were to be exposed. Those who praise the charitable work going on there would be informed that children of Manmohan Singh, Aishwarya Rai, Gavaskar or Tendulkar would not be going to these schools! Even they were to go by perchance nothing would have happened to them. Now about the support from the rich and the powerful. It is quite obvious that the money laundering racket run at Puttaparthi has clients of all shades of politics! There are also film actors and cricket stars who are perceived by the gullible public as the very epitome of virtue and righteousness. One of the cricketing icons was seen sobbing inconsolably at the demise of an ailing 80 plus old man. One wonders where were the tears when six young people around his age were murdered in cold blood in the bedroom of the paragon of truth at Prashanthi Nilayam- the abode of peace. In fact it is told that when the so-called Bhagwan was attacked he ran away like you and I, ordinary mortals, would have done, and switched on a siren, hearing which thousands of peace-loving people at the very epicenter of peace and tranquility in the universe came running to the abode of peace with whatever they could lay their hands on, probably for a peaceful demonstration of their love! How can this issue be tackled? He has been clever enough to start a trust with top retired bureaucrats, supreme court judges etc. who have considerable influence and can affect the outcome of any investigations. The best solution would be to remove all of them and appoint trustees from the government – from the center and states, and conduct an investigation into all these affairs. If this is not done, it will give the trustees ample time to cover up their misdeeds and financial mismanagement. No one can object to this, as charitable trusts are started with non-profit motives for doing social work. If the same work were to be done better by some others, why not they be allowed to do it? After all the funds have been donated for a charitable purpose with tax exemption. They could be used for the same! No matter how interesting the professor’s idea of removing all the trustees sounds, I am afraid it might already be too late. The SSB Central Trust has had many months by now to tie up most of the loose ends, and the Indian government has not exactly been keen to take action up til now. Still: the very idea appeals to me, I must say! Unearth the money, appropriate it and put it to its rightful use, as it was intended by (most of) the givers in the first place. And while they are at it, why not also unearth the body of his late greatness Sai Baba alongside, and perform a proper autopsy? Maybe that will yield a valid death certificate after all, and shed some light on what caused the master’s death.